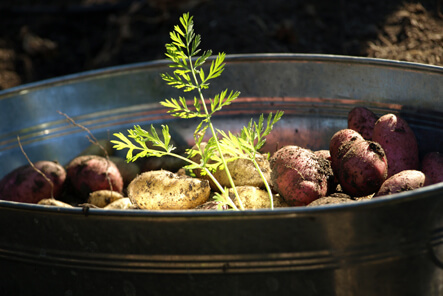 One of my favorite gardening activities is digging potatoes. Rich soil hides delicious, nutritious gems like the ones in the image above from our garden. Organic farmers talk about tending the soil — nurturing the soil so it can nurture the plants that provide fruits and vegetables for us to use in building healthy bodies. Rich, organic soil includes vast quantities of bacteria that are essential to keeping the soil healthy.